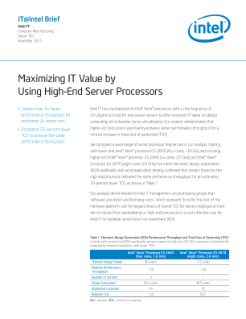 The document describes an Intel study that shows how high-end server processors maximize IT value by delivering higher performance throughput while lowering total cost of ownership (TCO). Based on these throughput and TCO advantages, Intel IT standardizes on Intel® Xeon® processors with a core frequency of 2.6 GHz for two-socket ...servers for design computing and enterprise server virtualization needs. Read the full High-End Server Processors Deliver Maximum IT Value Solution Brief. LoRa™ wireless technology—a game changer for IoT-enabled environments.